People have been known to swap everything from clothes to gear, but Meghan Ward of The Campsite and I are doing the world one better - we're "swapping" our outdoor blogs! Meghan and I exchanged interviews about our websites in an effort to get to know the person behind the work we so admire, and to share what we've learned with our audiences. Here's what Meghan had to say. The simple answer is that it’s the best way I know to express myself. Writing has always come naturally to me to the point where I’ll read something years later and hardly recognize it as something I wrote because I don’t ever remember thinking the words, just writing. I am also inspired to write because I believe that each person has a unique story to tell that someone else may learn from. There are times I have read someone else’s writing, whether it be a book or a blog, and found myself deeply moved when I came across text I could really relate to but had never been able to articulate. Whether I’m telling my own story or another person’s story, I am inspired to help others make sense of their own worlds. Where did the idea for The Campsite come from? The Campsite was a long time coming. Prior to creating The Campsite, I posted trip reports and outdoor related blogs on my personal freelance writing website. After some time, I wanted to devote my freelance site to the publishing industry, life as a writer and my publications, but I longed for a space where I could write about everything I’m passionate about in the outdoors. I also wanted to create a space that would feature more content about the inner experience as we explore the outdoors. So, I created The Campsite, a dedicated space where I could feature blogs about the inner journey and the outdoor world. In addition to that, I wanted to give back to the world of publishing and leave my site open to other passionate writers, photographers and multimedia artists to contribute. I was so thankful for the publications and websites that first published my writing, and I wanted to provide that experience to others as well. What's your ultimate goal with The Campsite? If you check out the Departments, you’ll notice a running theme throughout The Campsite. From “Lousy Day Literature” (great books and authors for the tent-bound) to “Around the Campfire” (tales of adventure and travel), The Campsite is all about sharing. My goal is that people come across the site and read or see something that will enhance or enrich their experience in the outdoors and encourage them to tune into their inner journey the next time they lace up their hiking boots or clip into their AT bindings. Developing a blog from scratch is no picnic. What's been the most challenging part? The most rewarding? that will enrich one's experience in the outdoors. At this point, the most challenging part is finding time. The Campsite is a side project, but something I always wish I could put more time and energy into. I also find it challenging to get the word out. If my own experience is any indication, I feel that people are on information overload. There are so many websites out there, so many pages to follow on Facebook, so much Tweeting, Digging and StumbleUpon-ing. I can’t keep up, so I don’t expect others to. It’s hard to make your content stand out, but I set a high standard for the site and I’m sticking to that. The most rewarding part has been the connections I’ve made with other bloggers, writers and outdoor enthusiasts. There are so many inspiring people out there! And the amazing thing about the Internet is that these new connections happen despite the fact that I am thousands of miles away from people. I have developed some very meaningful friendships with people I’ve never met. Their work motivates me to keep doing what I’m doing, even if I am not always aware of its value to others. What advice do you have for women who want to get started in some of the outdoor activities you love, but don't know where to start? I’d say start small and work your way up. For instance, if you’ve never been hiking, pick a shorter, more popular trail and gradually work your way up to long distances into the backcountry. Go with friends that are experienced and whom you trust, and once you’ve dabbled in the sport a bit, start to invest in good gear so that you feel confident and safe. Outdoor activities can be expensive up front, so do your research and find the gear that best suits you. When you’re out there, stay in tune with your instincts and find a healthy balance between going outside your comfort zone and scaring yourself silly. For me, the most important aspect of outdoor activities in enjoyment, so if I’m challenging myself to the point where I feel sick inside and scared to death all day, I won’t be enjoying myself. But, pushing yourself just a little bit at a time is a good thing. 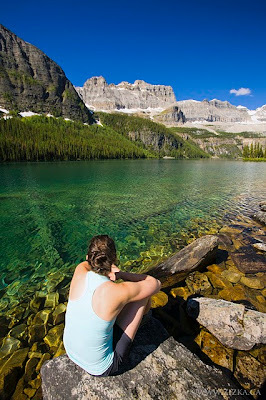 Boom Lake, Kootenay National Park, Alberta. What's a typical day in the life of Meghan? Is blogging part of your full time job? It sure is. 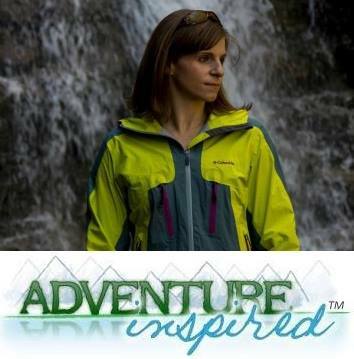 I work full time as an outdoor, travel and adventure writer, a copywriter for marketing materials and a magazine editor. 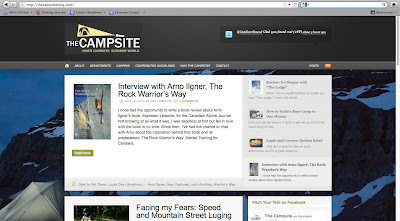 Apart from The Campsite and my blog on my freelance site, I manage and edit the blog for Highline Magazine, which gets updated two to three times a week. I have also been contracted to write blog-style articles for a variety of businesses and websites. My goal would be to make The Campsite more of a lucrative part of my job without compromising my values and vision for the site. My current connections are helping me take it in that direction, but I know it takes time. It's definitely hard to balance work demands and the day-to-day demands of life with getting outside and doing what you love. How do you find the balance? I feel so lucky to be able to say that I make a living doing something I’m extremely passionate about. I can hike into a backcountry lodge or travel up to the Arctic Circle and write about it (and get paid!). I can write destination guides about the Canadian Rockies, a place that is near and dear to my heart. I get to cover inspiring stories for magazines and meet some really neat people. This makes it a whole lot easier to find that balance between what I have to do and what I want to do. But, it hasn’t come without a lot of hard work and a certain amount of sacrifice. Of course there are times when I run out of steam with certain contracts, but keeping the big picture in mind really helps. Some of the most tedious or frustrating things I’ve done have led to some amazing opportunities. Connect with Meghan online via her website, Facebook, twitter, YouTube and LinkedIn. Follow The Campsite on Facebook and twitter. And don't miss the other half of the swap! 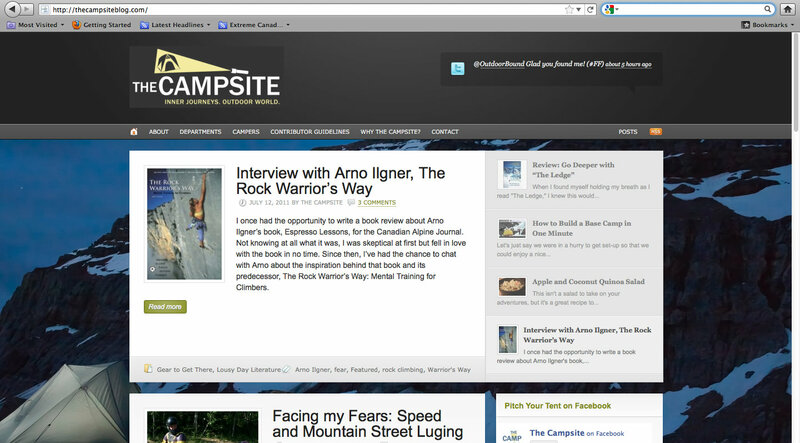 Click here for Meghan's interview of me on The Campsite.